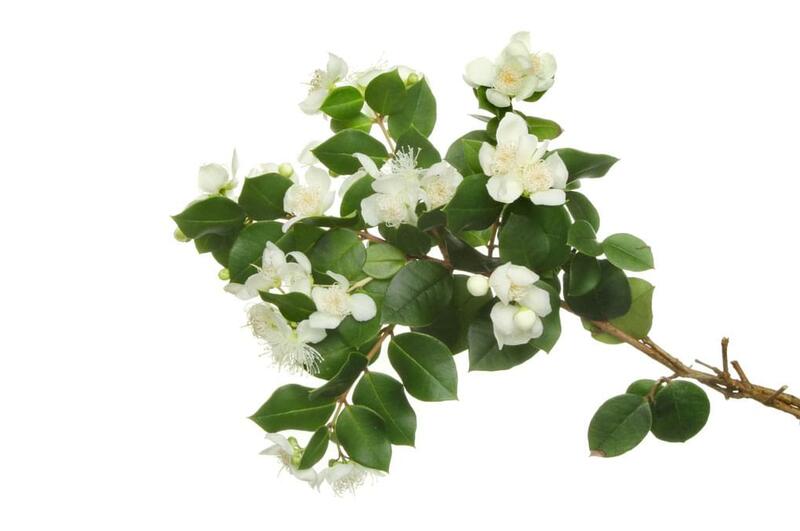 These essential oils are derived through steam distillation from stems, leaves, and flowers of the myrtle plant. Though myrtle is known for its medicinal uses today in America and all over the world, it first appeared in Ancient Greece. The consistency of these essential oils is thin with aromatic properties most closely resembling a fresh, lucid, mildly camphorous scent. Those wishing to dabble in the blending of essential oils may wish to try blending myrtle with Ylang-Ylang, rosewood, jasmine, coriander, clary sage, lemongrass, lemon, lavender, hyssop, ho wood, neroli, myrrh, frankincense, cedarwood, black pepper, eucalyptus, elemi, bergamot, benzoin, and atlas. These essential oils have many uses in the area of skin care including the following: mild infections, cystitis, pimples, acne, and hemorrhoids. Myrtle essential oils are also useful in treating leucorrhea and urinary tract infections. In both the elderly and in babies, they may help with chest infections. These oils might also be useful against vertigo, shaking, Parkinson’s disease, and Alzheimer’s disease. No reported negative side effects have been reported from the use of these essential oils. To be safe, pregnant women should seek the advice of their physician before using myrtle essential oils. They should also be kept out of the reach of children.